After the clunking great Vestax MR44, I progressed to the Yamaha MT4X four-track. The MT4X is a great recorder and to me felt like the Starship Enterprise back in the mid-1990s when I purchased the unit. However, I grew disatisfied with four-track recording and started to record and bounce down in stereo pairs, in order to achieve a more professional sound. 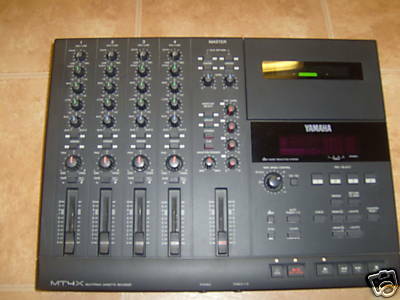 The MT4X was retired and sold when I move over to digital recording via the home PC around 1998. Though with our recent move, I discovered a case full of my old 4-track master recordings made during this period and thought it was a shame that I could no longer access these tapes. A quick scout on eBay brought up the MT4X and I purchased a unit for just over £60, including its original box and manual. 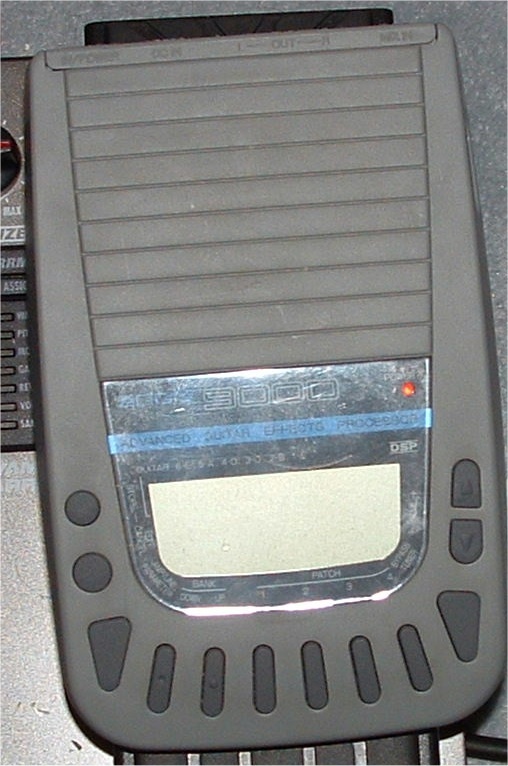 The unit itself appeared as new and worked great on the old tapes. It was strange to hear old stuff and to find tunes that you had completely forgotten about. I am presenting two such tunes today. The first I have called “Future Echoes” and I have no idea when or how it was recorded. It sounds to me as if it was recorded completely using a MIDI unit and I suspect it might have been during my dalliance with the Yamaha QY10, which would place this around 96/97 though I can’t be completely sure. It might be from earlier using a Roland MC-500 hardware sequencer I purchased in 1994. Who knows? It sounds a bit Krautrock and I like it. The second piece called “Afex” is a bit more abstract and completely unlike anything I’ve ever done before or since. Again, not sure of how I did it or why I did it or when I did it, but it is a slab of amateur dance electronica. Like the previous piece, no guitars were used in the recording. My first bass guitar was an Encore Coaster bass, which I still have. I bought it when I was seventeen from Allan Marshall Guitars in Markhouse Road, Walthamstow and learnt the rudiments on this instrument. I didn’t have a bass amp, so I just played “acoustically” until I got a guitar amp for Xmas, buy my folks had forgotten to buy me an instrument cable so I could connect my guitar to my amp, so I sat there over the Christmas holidays just staring at this silent amplifier. Ho, ho, ho! My first electric guitar was a second hand Columbus Les Paul Studio copy which I also bought from Allan Marshall Guitars for about £50 in 1990. This guitar weighed a tonne, but had some great sustain. Not sure if I ever recorded with this guitar – I might have used it on my early recordings, but I upgraded that guitar to a Yamaha in 1992. The Columbus eventually got sold at a car boot sale for about £80, so I ended with a profit. Hurrah! The Yahama guitar I used right up until 1997 was an RGX model, but it was unique in the fact that it had a removable clear PVC pickguard that covered the whole face of the guitar, the intention of which was that you could mount your own custom graphics under said pickguard. So I cut up some pages from a Roger Dean “Views” book that I had and mounted those making it a suitably “Prog” custom guitar. Eventually, I got bored with this and during my “hippy-punk” phase I remember making a montage from loads of small pictures of naked ladies snipped from appropriate magazines in an ill thought-out homage to Jimi Hendrix’s “Electric Ladyland” LP – it was meant to be shocking, but probably looked more sleazy than anything. So after one outing to a band audition, it got trashed. Oh, the folly of youth! I cringe with embarrassment now, but heck, this is the Internet – no-one is reading this, are they? In terms of electric guitar FX, the very first pedal I got was a Zoom 9000 multi-effects unit. The remarkable thing about this little gadget was that it was about the size of two packets of cigarettes, yet it was a formidable FX unit. It featured digital effects and all manner of settings to tweak and this was my first introduction to digital stereo delay: an effect that I swear by and rely on to thicken up my overall guitar sound and to hide my dodgy playing. Remembering back, I marvel at what Zoom were able to do with such a small device back in the early 1990s. I remember showing it to a fellow guitarist who came over to play once and he was completely blown away by the device. This is when I realised that guitarists aren’t that technologically savvy and tend to rely on huge racks of amps to get their sound. While I prefer to use electronic FX to get the same result. 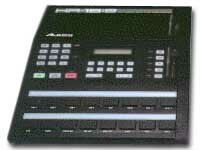 Of course, if you are going to record by yourselves in the early 1990s, a drum machine was par for the course. I settled on an Alesis HR-16B, which to this day is one of the best drum machines I’ve used, mainly for the simplicity of programming. I’m not the greatest drum programmer, so if I can’t pick up the unit and get a rhythm going immediately, I will give up quickly. I remember everyone raving about the Alesis SR-16 has being superior, and it was in terms of sounds, but when it comes to programming the HR-16 was pure gold. I got rid of that piece of kit when I traded in a load of stuff to get a Digitech multi-FX pedal from Hertford Music in Hertfordshire. The HR-16B had some cool sounds of its own and was quite expressive for a drum machine. As it is coming to the end of the year, there is a tendancy for you to get a little reflective and nostalgic for times passed. I realised that I created a section of my blog to look at the various equipment I’ve used and I’ve ignored this section completely. So this is my attempt at redressing the balance. My dubious recording career began around 1990 when I went to college and spunked a percentage of my grant cheque on my first piece of serious recording gear. 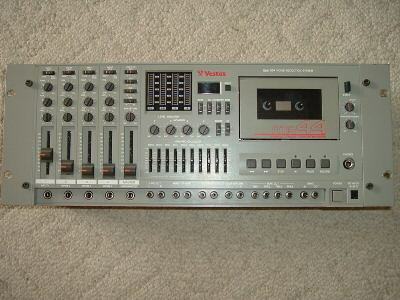 It was a Vestax MR-44 four-track tape recorder. In those days, I used to read Sound on Sound magazine religiously (and I still do) and I can say that I’ve learnt all I know about sound recording from that publication. Anyway, I remember seeing a review for the MR44 and deciding that this was the recorder for me for reasons long forgotten. The thing was that multi-track recorders cost a fortune back then and I needed something that was within my budget. My immediate memory of the Vestax MR44 was that it felt as if it had been salvaged from a Russian submarine. It’s design had what only could be described as a Soviet aesthetic and it had the same solid reliability of a breeze block. The buttons were small and there was an equally small LED tape counter – no fancy display screens or touch sensitive panels. The buttons clunked and clattered when you engaged the unit to record as if a series of pulleys and gurneys were being rattled into place. There were four sturdy volume sliders and EQ knobs to play with. In terms of sound quality, the unit was pretty neat and I spent much time bouncing down rhythm tracks and putting together silly little songs. In total, I think I recorded four CDs worth of material with this four-track, reasoning that The Beatles had recorded “Sgt Peppers” with just four tracks of recording power. What I forgot was that they were consumate musicians, they had the facilities of Abbey Road at their disposal and talent of George Martin behind the desk. Ahhh, the foolishness of youth! This is a close-up of the SL-20 control panel. A lot of people visit this website courtesy of Google looking for information about the Ashbory bass guitar. Seeing as I own one and there wasn’t a dedicated page before, I thought I’d cobble some information together for all you weary web travellers. Firstly, I got turned on to the Ashbory bass in 2000 when I saw it being used by Trey Gunn at a King Crimson concert. Expecting the instrument to cost thousands of pounds, I was surprised that you could pick one up new for around $200. At that time, there weren’t that many stockists in the UK selling the Ashbory Bass, but luckily I was visiting Los Angeles for my birthday in February 2001. A search on the web, brought up the details of Highland Park Music & Pawn. I got in touch with Doug the propreitor and arranged to pick one up on my visit. So for $200, I got myself a little bargain in black. The Ashbory itself is a unique instrument. It is around half the size of a standard bass guitar, fretless and uses silicon rubber strings. It is the combination of the strings and the pickup that makes the unique sound – it is supposed to give you a similar tonal range to that of a regular upright fretless bass for a fraction of the price. I like the tone of the guitar, but there are issues that make it difficult to play. Firstly, it is the tuning. My instrument is always slipping out of tune, especially the “G” string. The “G” string is always the first one to snap too and it can be expensive to buy replacement strings. Luckily, I found a man on the net that sells replacement “G” strings for a fraction of the price. Or you can download a high quality version of this video file from here. Just right-click the link and select “Save As” before selecting the place on your hard drive where you want to store the file.